The latest piece of disaster recovery equipment to come out of Japan is an ingenious feat of engineering featuring one of the most unusual applications of solar technology that we’ve seen. 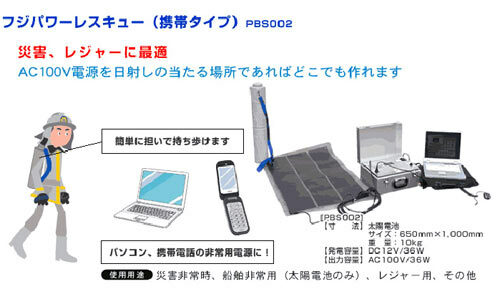 The Fuji Power Rescue is a portable solar generator developed by a company known as PowerBankSystem as an alternative electricity supply in the event of earthquakes or other disasters that disrupt the power grid. Comprised of a flexible solar panel, a battery and various pieces of cabling, the system fits into a backpack thanks to the fact that the solar panel is fixed to a sheet that can be rolled up into a tube. On arrival at a scene, rescuers can unroll the gear and get to work generating power (100V/36W) that should be enough for computers, phones and the like. Of course, that’s assuming the disaster is kind enough to strike in fine weather and not at night, otherwise the panel might make a nice blanket.